Every so often a room grabs my attention and I can't get it out of my head. I usually ponder what it is I like about the room, I wonder why it grabbed my attention, I hem and haw over it for a while and eventually show said room to Mike to get his reaction. Usually this is where my design dream comes to a screeching halt because while we agree about many, many things - in terms of design, we walk a fine line between desperately loving each others ideas and getting into heated arguments discussions about why we are so greatly opposed to his/her grand scheme to paint everything in chalkboard paint [hers] or put racing stripes on our kitchen aid mixer [his]. Fade to current day. 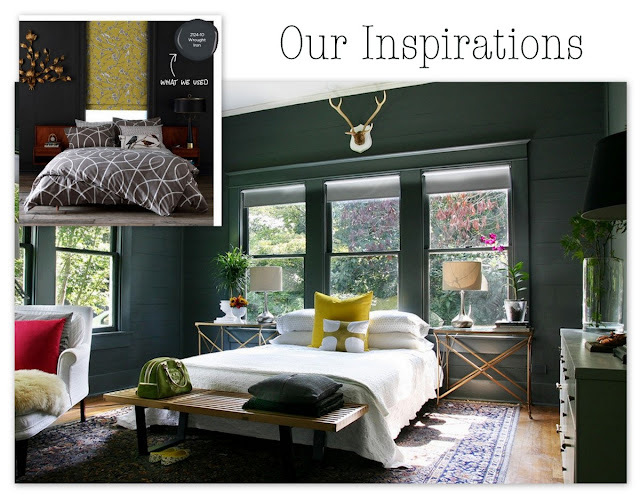 A few months ago I was perusing the internet and spotted a photo of Anna Beth Chao's recently painted bedroom in dark gray. Being on a gray kick lately, I instantly fell in love with the striking charcoal gray color. I put the idea in the back of my head and wondered about it every now and then but mostly thought, Mike will never go for this. Then the picture found its way to me again in the form of Anthology magazine where Anna Beth Chao's house and beautiful grey bedroom was featured, along with some other beautiful homes with extremely dark rooms. I couldn't stop thinking about dark rooms after that, you could call it an obessession really. Then on a whim one day, I showed the picture to Mike and he loved it....loved it so much he's painting our bedroom Bejamin Moore's Steel Wool as I type this. Truthfully, I'm terrified. Mike wasn't supposed to like the room and I was going to be able to continue living in a world of safe, normal color options like sand dune beige or arctic bunny rabbit white - not steel wool!! This will either be a great design move or a terrible one....stay tuned.